The two-seat single-engine reconnaissance-bomber Fiat ARF (Aeroplano-Rosatelli-Fiat) was a modified version of the Fiat BR, with increased fuel capacity and detail refinements. A company called CNA purchased two ARFs on behalf of the Russian trade delegation in Italy, under a contract requiring this company to test and deliver the aircraft. They were registered I-ARGA and I-ARGO and it was decided to ferry them to the USSR and not send them by boat or rail, despite the opposition of the technicians of the Russian delegation. The aircraft left Mirafiori and flew via Campo-formido but both crashed in October 1921 at Tulomino before leaving Italy; the Italian ferry pilots Stratta and Garrone were killed. This abortive undertaking was almost certainly the first attempt by the new Soviet Government to purchase aircraft abroad. ON the afternoon of July 16 there arrived at the Kenley Aerodrome a Fiat B.R. biplane, piloted by Lieut. F Brack Papa, accompanied by Lieut. Bonaccini, which had flown from Paris, having taken an hour and three-quarters to fly the distance of 225 miles. On the previous day it had travelled from Rome to Paris (687 miles) in a little over seven hours, despite unfavourable weather conditions. Some days before the machine had been flown from Turin to Rome, doing the 362 miles in 2 hours 15 mins. an average speed of 161 miles an hour. This beat the record for this journey, the previous best having been 2 hours 50 mins., made by Sergt. Stoppam on a Sia machine. The B.R. Fiat biplane was designed by Engineer Rosatelli just before the close of the War, to be used as a high-speed long-distance bomber. It is of the single fuselage tractor type, equipped with a 700 h.p. twelve-cylindered Fiat engine (170 by 210 mm.) which is claimed to be the highest powered engine employed for air work. It has a span of 51 ft. 9 ins., a chord of 7 ft. 9 ins., overall length of 32 ft., and a total supporting surface of 775 sq. ft. The diameter of the tractor screw is 11 ft. 3 ins. The struts and wires are all streamlined. The weight of the machine empty is 2 1/4 tons, and the useful load 1 1/2 tons. Its maximum speed is 163 m.p.h., and its climbing speeds are as follows :- 1,000 m. (3,280 ft.), in 3 mins. 45 secs. ; 2,000 m. (6,560 ft.), in 7 mins. 30 secs. ; 3,000 m. (9.842 ft.), in 12 mins. 30 secs. ; 4,000 m. (13,123 ft.), in 18 mins. 16 secs. ; 5,000 m. (16,400 ft.), in 27 mins. At the actual exhibition Italy is represented by two machines only. One is the large Fiat biplane, on which recently Lieut. Brack-Papa flew from Italy to England, and which was not crashed in France on the return journey as stated in the daily press, and the other is a Caproni three-engined machine, turned into a commercial aeroplane by adding a cabin to the fuselage. A third Italian machine is, however, flying at the E.L.T.A. aerodrome - the little S.V.A. biplane with Warren girder wing bracing. Arriving from France by air, the Fiat biplane, on which Lieut. Brack-Papa flew from Turin to London recently, is now exhibited at the E.L.T.A. show. As the machine was described and illustrated in FLIGHT of July 24, 1919, no detailed reference to it is necessary here. It is a very large, single-engined two-seater, with a 700 h.p. 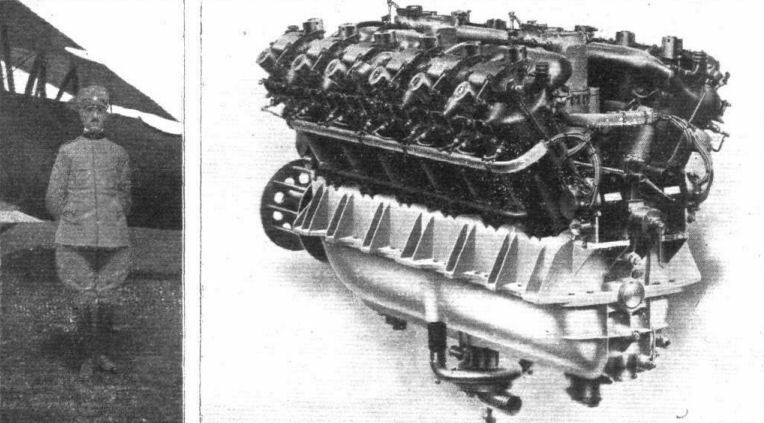 Fiat engine of the 12-cylinder Vee type. The fuselage is of the ply-wood covered type, with the two seats arranged in tandem, the pilot in front. The control is of the wheel type for the ailerons. A very large petrol tank is placed between the engine and the pilot's seat. The radiator is placed in the nose of the fuselage, and under the bottom of the body, just behind the front chassis struts, is a small oil cooler of copper tubing. In order to reduce the air resistance of the 12 exhaust pipes, each set of six is enclosed in a stream-line casing projecting outwards and downwards from the top of the cylinders. The most interesting feature of the Fiat B.R. is, perhaps, the wing bracing, which is of a somewhat unusual type. The centre section struts are arranged as in the Sopwith 1 1/2-strutter, i.e., the form of a letter W as seen from in front. The inner bay of the wing bracing has no lift wires, diagonal struts sloping from the top of the outer centre section struts to the base of the first pair of inter-plane struts, being thus in compression under lift loads. The outer bay of the wing truss is wire braced, the lift wires being in duplicate and enclosed in a stream-line aluminium casing, while the landing wires are single Rafwires. It might be mentioned that all the terminal connections of the wing struts and wires are enclosed in stream-line aluminium casings so as to reduce air resistance. As mentioned in our issue of July 24, the machine has a maximum speed of about 160 m.p.h., and her appearance at the E.L.T.A. aerodrome was hailed with delight by the visitors, most of whom had probably never seen a machine flying at such high speed. The Fiat did not, however, remain long at the aerodrome, but was put into the exhibition the day after her arrival. The B.R. Fiat biplane which was flown last week from Turin to London, with stops at Rome and Paris.